In my experience, I've learned that friendships can have a natural tendency to go through different stages. At one moment you're both super close and telling each other everything, but then a few years later, you just chat and see each other once in a great while. There are many reasons for these changes in the friendship dynamic... one getting married while the other is still single; one taking on a totally different career path from the other; one having children while the other has no children and so on. Even though these changes can be upsetting for one or both people, it is a natural and healthy change in the friendship. We are all growing and evolving as individuals, so what we may have been interested in before may not be what we are interested in now. 1. They're critical of you. Do they criticize the way you dress? Do they put you down for not doing something "perfect"? That being said, do they talk badly about you to other people? 2. They seem to want to "compete" with you rather than support you. Do they make comments to you that highlight how they "did that better"? Did they manage to accomplish something, but then put you down for not doing the same? Do they try to take up your interests or hobbies in a way to try to "beat you" in some way? 3. They're users. Are they always asking you to do them a favor? Do they owe you quite a bit of money, but keep making excuses to not pay you back? Are they always coming to you looking for help but they are never there for you when you need help? 4. They try to make moves on your partner -- or they start dating your ex without discussing it with you first. Actions like this are a reflection of how much they truly value your friendship. 5. They lie to you -- a lot. A few little lies is one thing, but when there are many, it can really negatively effect the genuineness of the friendship. If you are the type of person that values honesty, vulnerability and creating depth in your relationships, then having a friend that chronically lies isn't going to support you in that. 6. They don't really support you. When you are going through a difficult time, are they there for you? Do they provide you with a good listening ear? Do they support you in your goals? Do they "cheer you on" in your endeavors and ask you how you've been doing? Finally, ask yourself the following questions: Why am I friends with this person? What do I gain by being friends with this person? What do I enjoy when being friends with this person? If you can't really answer those questions and a few or all of these five signs are true for you, then a legitimate breakup may be in order. 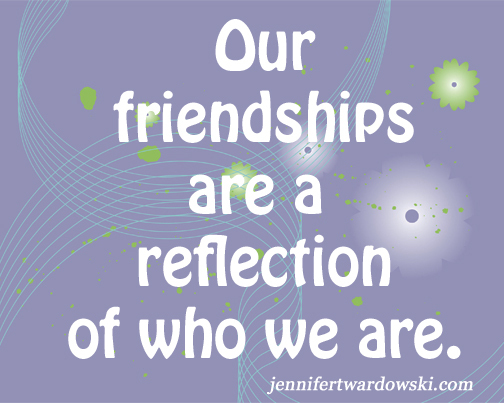 Ultimately, remember this: Our friendships are a reflection of who we are. As we are growing and evolving as human beings, we may realize that some aspect of ourselves is no longer serving us. As a result, we may find ourselves needing to let friends go as well. It may involve creating some distance to give ourselves space to grow or it may involve needing to set boundaries for ourselves and "breaking up" with that friend. Either way, both are a natural aspect to our growth. In the comments below, share if you have ever had to breakup with a friend. What was the cause? What happened? What did you learn from it? How has it impacted your life? Jennifer is a self and relationship coach and teacher. She helps women worldwide create fulfilling relationships with both themselves and others so they can live happy and joyful lives. Click here for her Free Self and Relationship Healing Meditation. "Bad news and good news... Bad: cottage cheese is slow digesting and shouldn't be eaten everyday. Good: I'm sore from tennis."